New e-mobility means safety for the user to achieve his goals and to accomplish tasks without having to pay attention to the range of his electric vehicle. Port New provides various technologies to charge the batteries of all electric vehicles quickly and safely and provide the best comfort for the user. At the same time, Port New's technologies are constantly evolving to meet diverse and changing needs. The all-rounder of Port New’s technologies is the charging station eMoCAB M3. With up to eight simultaneously usable charging points and a robust construction, it fulfills the requirements of an urban environment with permanent use. The user selects his product via a touch display and is billed using modern payment methods. From pre-paid credit to mobile payment, all options are available. Currently, the user has a charging power of up to 2x 11 kW available. optional mit elektronischen Zählern für jede einzelne Steckdose, diese können verschiedenste elektotechnische Kenngrößen während des Ladevorganges messen, speichern und im Display anzeigen (u.a. Blind-, Wirkleistung). As an application for the private or commercial fleet sector, the wall box of Port New offers all the features. It can either be used for direct charging with up to two connection points or via the eMoSat as a satellite system. With currently up to 11 kW power, electric vehicles can be charged. The Wall Box is ideal for use in public and semi-public areas such as car parks and parking lots. The charging station for electric bicycles offers a particularly easy handling for the user. The battery and cable can remain in one of up to four storage compartments of the charging station during the charging process, secured by a coin deposit. Especially for fleets and in the public sector, the control of satellite charging stations is the ideal solution for handling a large number of charging stations. 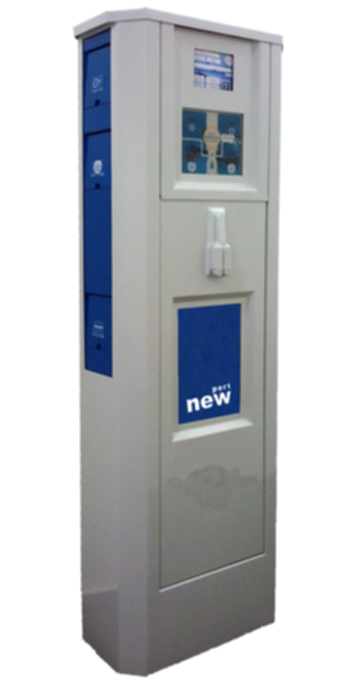 Based on a master charging station, Port New offers the handling of up to 50 satellite charging stations. Only billing is required on the Master. In this way, easy handling is guaranteed to the user and offered a uniform billing concept. Port New has carried out a research project together with the ATI Westmecklenburg. The aim was to demonstrate the potential of electric mobility of Port New technology in public spaces for regular and fast charging stations. As a result, it has been shown that in Mecklenburg-Vorpommern there is a high demand for infrastructure for electromobility. Port New wants to address this with its technologies and make a contribution to driving forward electromobility in the country. Leipzig now offers a dense network of electric charging stations. Since the beginning of the inclusion of electromobility by the Leipzig municipal utilities, the NKT Cables technology has been installed in the city and provides more electric vehicles annually. Charging stations were installed at locations at Gompitz Park and the central depot of DREWAG, which were able to map an initial network of charging stations in the region of Dresden at an early stage. In Chemnitz, the city's first charging station was installed in 2012 with the NKT Cables. In the immediate vicinity of a car dealership, it also promotes interest in electric vehicles. In Hoyerswerda, utilities have put into operation two charging stations. For this purpose, the city also set up suitable parking spaces for electric vehicles. Port New GmbH & Co. KG was founded with the aim to further develop the charging station technology of NKT Cables and to distribute it throughout Germany. To this end, the Port New cooperates with partners from Germany and abroad. In cooperation with partners from the region and know-how carriers from the international automotive industry, the production of the charging stations continues. In addition, sales concepts and business models are developed for various target groups. Another technology and business concept of Port New is the rental of batteries for electric vehicles. Corresponding investigations are currently being made. If you have questions regarding our products or you just want to drop us a message, please fill out the form below.